Lord Blackwood : Sherlock Holmes. And his loyal dog. Tell me, Doctor… as a medical man, have you enjoyed my work? Watson : How did you see that? Now Watson had every bit the ability to see everything that Holmes could see, but did not see it. Why? Because he was not looking for it. Holmes did see the deadly needle. Why? Because he was looking. There are many things that we could see with our physical eyes, as well as the eyes of understanding if we were willing to look. If one does not look or is unwilling to look he will not see. There are many things the seeker could see but it has just not occurred to him to look. The normal range of vision is just accepted as all there is so why try and see more? The fact is you can see more with both your physical as well as your spiritual eyes. I’m going to give you a couple exercises today that will increase your faith in seeing. Sit back in your chair, look around your room and find a light colored background. A wall or ceiling is fine. If there is not one where you are go to a room that has such a background. Place your hands together so the tips of your thumbs are touching each other. Now hold your hands up about a foot from your eyes in your line of vision between you and the blank wall or ceiling. Next, slowly separate your thumbs until there is about a quarter inch of space between the tips. Just as you start to separate your thumbs focus intently on the empty space between them. After you attain the quarter inch of space continue to look at that empty space. As you look you will see a bluish or gray film that extends about a millimeter or two from your thumbs. You are now seeing your etheric body, the double of your physical. If you do not see it at first keep looking at the empty space, letting your mind go blank, tuning out the physical. Most people will begin to see it after a minute or two. Etheric vision works best when you use the principle of “not seeing” that was covered in the last lesson. Tune out the physical and just look at the empty space and etheric vision will manifest. Find another person and have him or her stand perfectly still in front of a light colored wall. Stand or sit a few feet away and stare intently at a single point on the person’s forehead. Do not take your eyes off this point for at least a full minute. You must focus without deviation and the subject must remain perfectly still. Then after a minute has passed have the person walk away but your eyes must not follow but continue to look at that same location of space. As you now look you should see an after image impressed on your eyes of the etheric body. 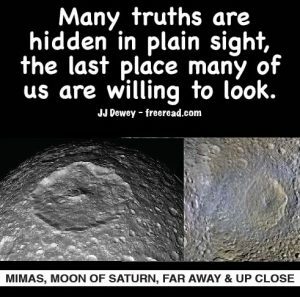 Because you focused on the head that will be most visible, but usually you can see the whole light body. If you are sensitive you will see the light varies in intensity in different parts of the body. If the person is ill or depressed he will have dark patches in key places. If you have successfully accomplished these two exercises (and most do) then you have taken an important step. It is that you have proven to yourself that the world’s assumed limitations on seeing are not correct. You have just seen something you are not supposed to be able to see that exists beyond the physical. It tells you that this may be the tip of the iceberg in new seeing. Maybe there are many other things to see that you have missed just because it did not occur to you to look. Indeed, there are many things. The assignment today is to ask yourself this question and reflect on the answer. What other things are there that I am not seeing with both my physical and spiritual eyes? Can I bring more of the invisible into focus by using the principle of not seeing? If you successfully applied the last lesson you proved to yourself that you can see beyond the physical world with your physical eyes. Some type of inner or spiritual vision was not even necessary. They say seeing is believing, so even a non believer at this point, if he is honest with himself, will have to admit what he has seen. This is just the beginning to what you can see that is beyond the physical. The etheric physical double is fairly easy to see for those who look, but finer grades of matter are more difficult. The next step is to see the light from the aura, which is strongest about six inches to a foot from the body. The step after this is to see the colors in the aura. It takes about seven times the focus to see the aura as it does to see the etheric film that extends a millimeter or so from your body. Not many can see the aura on the first attempt but most can after a period of dedicated practice. You may see colors today if you are more sensitive than most, but there is a good chance many can see some astral light. Again select a volunteer, but this time have him or her sit in a chair a few feet in front of you. If you do not have a volunteer then you can use yourself by looking in a mirror. Yes, the auric light reflects in a mirror. Now pick a spot about three inches above the volunteer’s head. If you are looking in the mirror remain very still and pick a point about three inches above your head. Now stare at that empty point with the attitude of mind that you are not seeing your physical body but will see whatever else is there. Focus for up to ten minutes or until you see a light or colors beyond the body. When you first see the auric light the tendency will be to stop focusing and pay attention to it. The moment you do this it will vanish. As soon as you first see the light you must maintain the attitude of not seeing. Create a state of mind that is not surprised and doesn’t care if you see anything or not. To continue seeing continue focusing as if nothing has happened. About half of you should see something on the first couple attempts. The other half can see also if they continue to practice. If students practice regularly all should be able to see auras by the end of this course. Let me tell you what you can see if you practice extending your vision. After you see the light of the aura you will start to see beautiful neon-like colors. The colors will extend around six inches from the body and will reflect the mood, intelligence and spiritual focus of the person. I will not go into the meaning of all the colors as they are readily available through other sources. If you continue to practice seeing you will see that a higher grade of matter extends further out and encases your body in somewhat of an egg shape. You will see that the outer matter circulates around your body making you correspond to a human atom with your body as the positive nucleus and the aura like the negative electrons. Just like an egg has a film on its outward edge, just below the shell, your body has a film on it that acts as a receiver of your thoughts. As you think your thoughts are projected in geometric forms on this film and they dance around like images on a kaleidoscope. These images are very difficult to see and require a lot of practice. Beyond this the trained observer can see the etheric light behind all images, even inorganic ones and an aura of some kind around all living things. Average humanity may look up in the sky and see points of light that are stars, but the dedicated observer can see a night that is full of light with the auras of stars interplaying with other stars in a divine relationship. The point of this lesson is to stretch your mind into accepting that there is much more to see than standard vision reveals. And we have just covered what can be seen with the physical eyes (with a little help from inner vision). On the other hand, when focusing on inner vision and using the eyes of understanding there is much more that the student can see. The important step at this point is to realize that you can see much more than general humanity has been led to believe. Your assignment today is to practice seeing the aura as outlined and to reflect on this statement throughout the day. The lessons on seeing beyond the physical will be helpful for two reasons. First it proves to the student that there are things to see beyond this realm. It should add to one’s faith that there is more reality to see and contact. Perhaps the idea of contacting the soul, higher self, or God within does not seem so far fetched now. The second helpful truth to be absorbed by the seeker is the principle of “not seeing.” This is very helpful in negating the great obstacle to soul contact, which is fear and its two associates worry and concern. We were discussing the problem of fear but needed to digress to introduce this principle, which is essential to mastering it. The goal with fear is not to eliminate it, but to take from it the power to have a negative effect on you. As long as we live in this material world with all the possibilities of loss all people are subject to some fear. Believe me, if you’re in a car and the driver is headed over a cliff you will have some fear. The worst way for the seeker to handle fear is to deny its existence. Denial is a form of dishonesty and any type of deceit hinders the seeker in making soul contact. Before fear, worry and concern can be mastered they must be seen for what they are. Is it possible we could have a financial collapse, a nuclear war or great natural or personal disaster in the immediate future? Should we pretend that such events could not manifest? No. That is the worst possible approach. One should always be aware of all possibilities that may have an effect on him. Do what you can to prepare, but in many cases full preparation may be impossible. What should the seeker do then? There are always things to worry about and most people give too much attention to their fears. The key is to only put enough attention on fearful concerns to enable you to handle your life effectively. When you have done what you can then put all concerns out of your mind, not by denial, but by not seeing. When you attempted to see the auric light you looked in the direction of the physical body, but not at it. You tuned out the physical by not seeing. If you succeeded it was as if the body was not there, but the aura was. This approach may be used with fear and other negative emotions that need to be neutralized so the seeker can explore the inner world in peace. There is no fear in the inner world of Spirit because there is no possibility of loss there. If therefore the seeker can bypass this world and see the inner world of perfect peace then fear, worry and concern will seem to be a part of some illusion going on in the background that is of no concern. When the seeker is on the stage he sees the possibility of loss and has to deal with fears and concerns. Many people never leave the stage and thus fear and worry are their constant companions. The seeker learns to exit the stage when the participation is not necessary and thus obtain the peace and rest necessary to commune with his soul. In addition when you get a chance to look in the mirror practice again seeing the auric light by looking at a point six inches above your head and not seeing your body. The obstacles to soul contact that originate in the emotional body are many. We have already covered quite a few such as grievances, guilt, false gods, and fear. Another one high on the list is victimhood. Many a seeker gets caught in this trap that forces his eyes away from the inner Spirit to the outer personalities, and away from the Inner Voice to the cacophony of the many outer ones. The victim blames other people for his problems and then focuses outward where the blame seems to lie. This directs the attention away from the soul. The reasons for blame are many. Here are some examples. If the victim is irritated he blames someone else for causing it. If the victim suffers loss he blames another for causing it. A victim is outraged by apparent insults and blames another for his feelings. A victim feels deserted and isolated if he does not get enough attention. If the victim suffers ill health or pain, he will blame some cause out there, or God. If the victim does not reach his goals then someone else is to blame. When the victim makes mistakes he blames another. That should be enough to give the reader the general idea. Not all victims are a fit with all the examples given. Some just feel a victim in certain select areas of life while others seem to feel a victim in every way you can imagine. Unfortunately, even a small amount of victimhood creates a barrier to full soul contact so the seeker needs to do a powerful self-examination and weed out such feelings. One problem that seekers have with the victim mentality is, to the personality self-victimization is very easy to justify. If feelings are hurt then it is easy to blame such feelings on some thoughtless statement made by an associate. If loss is suffered it seems like someone else’s mistakes were really the cause. A natural question at this point is this: Isn’t it the case that sometimes you are a real victim? Suppose someone just stole a large sum of money from Jim. Wouldn’t he be justified in claiming victim status here? Often the person who feels a victim will blame others for his problems when the problem seems to onlookers to be mostly his fault, but there are other times, such in the example, where the problem does seem to originate from outside the victim’s control. Even here, a little investigation may reveal the crime could have been avoided. Maybe the guy did not lock his door or just trusted someone without reason. But let us suppose that a victim can state a circumstance that proves that he is a victim, that the problem is definitely the other guy’s fault. Is he then justified in feeling the victim? Is someone wrongs the seeker he must apply the principle of forgiveness and let it go. Before the seeker can transcend the feelings of the victim he must discover them. A problem is that many who suffer feelings of victimhood do not admit to themselves that they have such feelings. If the feelings are not acknowledged then they cannot be eliminated. Therefore, the next step for the seeker is to examine himself and honestly determine whether or not any feelings of victimization reside within himself. This is your assignment today. Reflect on your feelings and honestly determine if there are any ways that you see yourself as a victim. If you attempted yesterday’s lesson you searched through your past and present to find examples where you took the role of a victim. If you are like most you were reluctant to admit any such cases. After all, a victim is seen as someone who is weak and none of us like to see ourselves as weak. Even when playing the victim to the hilt the person usually does not see himself as weak and is unlikely to admit he is a victim for that reason. Instead of admitting being a weak victim he will see himself as a strong blamer and justified accuser. At least he would be very strong if those he blames would just get out of the way – he thinks. This, as with all emotional blockages, is very difficult to pin down for what it is, for the feeling nature distorts and turns the truth upside down in his own heart so black is white and weak is strong etc. Let us look at an example. Jack was in an accident that caused him to lose some work. He felt the insurance company owed him a large settlement so he retained an attorney and went after the largest amount possible. After the dust settled he received a payment, but not as much as he deserved. The injury involved his shoulder which was basically healed at this time but he got a doctor to say that there were still problems and so he legally pursued a larger settlement. This attack on the insurance company and pretending the shoulder was worse than it was went on for five years. Because energy follows thought his shoulder did develop more problems and the final settlement Jack received only paid his legal expenses. At this point Jack’s life was in shambles and he blamed the insurance company for all his woes. He was a strong person he told himself, but the insurance company not doing its job ruined his life. Jack, who is a terrible victim of his own thoughts, does not see himself as a victim. Now consider this. Jill had a similar accident with similar injuries and insurance coverage. She took the insurance offer which she thought was fair and rejected the advice of an attorney to emphasize her injuries and go after more money. Within a month she was back at work and the shoulder had healed enough so any problem was negligible. The rest of her life was lived as if the accident had never happened. The thought of being a victim never entered into her head but neither did she see herself as particularly strong. She just saw herself as someone making the best of her life using the cards that had been dealt. Notice that Jack saw himself as the strong one, but was the real victim and suffered in quality of life. Jill didn’t focus in being weak or strong, but just making the best of each situation as it came up. Jill in not trying to gain strength through blaming others was an example of true strength. Of the two Jill was the one who was not placing blockages between herself and the soul. There are two major difficulties for the seeker in discovering his victimhood. The first is that people do not want to see themselves as weak, even when they are participating in weakness. The second is that the emotional nature distorts reality to conform with desire. Since most desire to be strong, the emotional self with distort the victimization to appear as strength. Sometimes the seeker is too involved in distortion to get the truth from himself. That is why we have relationships. Sometimes others can reflect the truth back to us better than we can see it for ourselves. The assignment today is to ask a friend, spouse or associate who knows you well whether or not he or she thinks you ever play the victim. If he thinks you do play the victim then hear him out and consider that there is some truth in what he says. Do not get upset. Do this exercise with at least one person. Two or three would be even better but find at least one. We all have a blind spot related to our physical eyes. Fortunately our mind compensates for this so we are not aware of it in normal living. It is easy to detect though. Note the R and L below and follow instructions. Cover your left eye and look at the R, move closer of further away to find where the L disappears. That location is where your optic nerve attaches to your eyeball and is where no visual information is processed producing a blind spot. The Law of Correspondences holds true with the blind spot as it is duplicated in our feeling nature as well as our mental selves. We’ve just finished talking about the victim mentality. Many such people have a blind spot about their playing the victim. The alcoholic is another example of one who has a blind spot. The emotions are always involved in this and sometimes the mind. Many alcoholics who are in big trouble will just not admit they have a problem. Often times the only way they become convinced is when all their family and friends gang up on him and all relate, one by one, the same observation, that the guy indeed has an alcohol problem and it is ruining all his relationships. Even this does not always work, but it does at times. When successful, the alcoholic finally faces the fact that so many voices saying the same thing cannot be entirely wrong. Like the alcoholic we often resist, with great effort, any outside attempts to reveal our blind spot. Outside of our blind spot we may be geniuses, but within it we may appear to be blathering idiots to those who see truly and take pity on us. Think of a friend or two who you know well, They may be very competent and self aware in almost everything, but if you think about it you will notice a blind spot – an area of their lives where awareness or intelligence seems to be lacking. This is easy to see in other people you know well, but difficult to see in yourself. The blind spot is important to find because it often causes enough deception in your life to hinder soul contact. Once it is found you can then just factor in this natural weakness and compensate for it with your strengths. Perhaps you have already done this, and perhaps not. Your assignment today is to discover your blind spot. Reflect upon your life where people complained about mistakes or problems you made that did not seem like mistakes to you. Sometimes reflection is not enough and you will need he help of others. Again find a friend and explain that you are looking for your blind spot and ask him or her if he sees one in you. Once you have discovered it then contemplate as to what you can do to compensate for it. Another trait that causes distance between the seeker and the inner voice is criticism. This is a very similar problem to being the victim as it causes the person to focus on problems without rather than himself. Energy follows thought and if the focus is on problems without the problems of within will not get the needed attention and personal corrections necessary. Soul contact will suffer interference. “And why beholdest thou the mote that is in thy brother’s eye, but considerest not the beam that is in thine own eye? Or how wilt thou say to thy brother, Let me pull out the mote out of thine eye; and, behold, a beam is in thine own eye? Here Jesus tells us that many of those who are quick to criticize his brother are trying to correct a minor problem while they themselves cannot see clearly because their own vision is obscured with a much bigger problem in need of correction. The person in the example has a beam in his eye while trying to take a small sliver out of the other guy. This is also related to the blind spot. The critic is oblivious to the fact that he has a much bigger problem than the guy he is trying to correct. There are three major problems created by criticism. First it places attention on a problem outside of oneself when a blind spot may be hiding a bigger problem with the person’s own personality. Secondly, it places consciousness and energy away from the soul instead of toward it. Thirdly, in most cases, the person being criticized is affected negatively, especially if he feels the criticism is not just. And even if the person knows the critic is correct he may harbor negative feelings just for being reminded of his flaws. Then too, it will not matter if the criticism is just or unjust if the critic delivers it in a harsh manner. If the person being criticized has a negative reaction then he is likely to lash out which will create an emotional storm in the relationship. Such an emotional interplay will make soul contact much more difficult. Even if the seeker had it before the criticism, he is likely to find it greatly diminished afterwards and the only immediate cure is to make amends with his friend. A question to consider is why is it that people are so sensitive to criticism? Rare is the time that you point out a flaw in a spouse, friend or associate that they smile with appreciation. They may hide their feeling of offense, but generally people are offended at any personal criticism. The main reason is that pretty much all of us, think we are doing our best at handling life and when someone comes along and points out a flaw it is telling the individual that maybe he isn’t doing his best after all. Maybe he is a bigger failure than he thinks. It is human nature to not want to see ourselves in a negative light. On the other hand, most of us have no problem seeing negative attributes in others. Another question that arises on this subject is when we should criticize. Sometimes it seems as if a correction is necessary. Yes, there are times when a criticism is essential, but I would guess that nine out of ten of them are not. To know when to criticize is a knowledge had by few and is almost an art to do it correctly. If he person has soul contact then it is best to only criticize when one gets the go-ahead from the inner self. Before criticizing anyone the question to ask is whether it is necessary and would it do any good? When I ask myself this question I usually get a no and restrain myself. Jesus makes the interesting statement that if we take the beam out of our own eyes we will then see how to correct our neighbor. When this vision is seen it usually does not involve any criticism that can be construed to be an attack. Maybe it will involve something liked buying the friend a book that will help him improve himself. A gift is appreciated much more than a criticism. The assignment today is to reflect on three criticisms you have given in the past that produced negative results. Ask yourself if the various criticisms were necessary and what you could have done differently. Ask yourself if you criticized from the perspective of being superior rather than a sincere desire to help. Now pay attention to yourself, not only today but through the whole week. You will be tempted to criticize several times. When the temptation comes ask yourself: Is this really necessary and is there another way to handle this problem? Remember that those with access to the soul are slow to criticize and quick to give sincere encouragement. In addition to your criticism of others causing interference with soul contact, others criticizing you can have the same effect. Criticism is hard to take, even when we know the critic is right, even when he has a sugar coated approach, even though he is a good friend or a loved one… Sometimes you would just as soon the criticism come from an adversary clearly out to get you so you can lash back at him with some justification. The seeker needs to look at criticism much different than the average person. He should look at it as a spiritual exercise. Here is a guy letting you know of your faults and your emotional self feels hurt and wants to attack back or carry a grievance. Your emotional self feels that you are doing your best and do not deserve the criticism. If anything, you deserve a pat on the back. Here your mind must take charge, tell the emotional self to calm down and look on this as an opportunity rather than a problem. If you can keep the emotional self in peace, even through an encounter with a harsh critic, then your spiritual muscles will be strengthened, allowing for less interference to soul contact. On the other hand, if you take offense and harbor a grievance because of a criticism you have just placed one of the most impenetrable barriers between you and the soul. The seeker must not allow this to happen. There are a number of ways people respond to criticism. Some take offense at the slightest hint of wrongdoing and harbor negative feelings. These people are rarely at peace with their emotional selves. Others try and take criticism well but then when the right buttons are pushed they will jump into full-fledged emotional turmoil. A few have learned to minimize the effect of criticism by seeing it for what it is. If it is true then you have a chance to learn more about your flaws and can improve yourself. If it is unjust then it is meaningless and you just ignore it. Lashing out and attacking back is not a desirable response, but there is something worse you can do. You can suffer in silence and hold a grievance. If you find yourself in this trap you must dispel the grievance through communication. Review lessons 8-14 for procedures on handling this. It is difficult even for advanced souls to neutralize the negative effects of all criticism, especially if it comes from a loved one or someone respected. The solution to handling criticism is simple, but the application, in some circumstances is difficult. Betty is a beginner in a yoga class and as the group is practicing a difficult posture the instructor points to Betty and jokes that she looks like a walrus struggling to stay on a piece of ice. The whole class laughs, but Betty does not think it is funny at all. She feels like ducking out of the class and running home crying. It takes all her strength to handle the situation with dignity, yet without retaining negative feelings. Poor Paul did not have a harry chest and thinking about her statement depressed him and hurt his feelings. His wife was oblivious to the effect of her words. The truth is that as we go through life we are going to get hit with hurtful criticisms and statements. The seeker must learn how to neutralize them to maintain maximum soul contact. Unfortunately, there is no magic bullet, but I will give two pieces of advice. First the seeker must make a definite decision to make a goal to neutralize all negative feelings caused by any criticism or personal attack. When the seeker reaches the point where he can take any blast of negative attack and remain in peace then he has made a huge step toward greater soul contact. The assignment today is to think back on three different occasions where you received a hurtful criticism. How did you react? If you had it to do over would you handle then differently? Be aware this coming week of any criticisms you receive and observe how your mind and emotions handle them. Give yourself a grade. The important thing is to be aware that the negative feelings generated by criticism need to be neutralized and make it a goal to master them. We have discovered that it is a precarious thing to criticize others and because of human nature any attempt at correction must be handled delicately. We have also come to the realization that we, as individuals, do not like criticism either and the tendency is to either take offense or outright reject what has been offered. This is a mistake. If the criticism concerns a personality flaw or some weakness in a work you are attempting then you should pay attention even if the person comes cross as extremely rude. To just outright reject a criticism because it is not given in the right tone may cause you to miss an opportunity to see a flaw and move yourself forward to real accomplishment. That said there are criticisms that are best to outright ignore, such as those dealing with clashes of beliefs. For instanced, if someone calls you stupid or ignorance because you voted for a different political candidate than he did he is grouping you with half the population that he is insulting. These type of insults generally offer no need for introspection. I had a rude awakening when I was young that woke me up to becoming more open minded toward criticism. When I was a teenager I loved the early sixties music. I used to memorize many of the songs (Del Shannon was my favorite) and sing them around the house. At the time I thought I had a great voice. When I listened to myself it sounded pretty good to me. In fact I thought I could sing the songs about as good as the original artists. What amazed me is that my Mom and Sister constantly complained about my singing. I could not understand this complaining and wrote it off as a lack of appreciation for modern music. I ignored them and kept on singing thinking that eventually they would learn to like the songs as I had. My parents were divorced at the time and my Dad paid us a visit. He heard my singing and it was just too much for him. He felt a need to enlighten me. He borrowed a tape recorder from a friend and brought it home. In those days it was a novelty to have a tape recorder and up to that point I had never heard my singing voice played back to me. I was eager to hear my “beautiful” voice so I sang my favorite song ““Runaway” for the family. It demanded a falsetto so I thought I would really sound impressive. After I finished the song my Dad played it back to me with a knowing grin on his face. I couldn’t believe my ears. I thought I was in the Twilight Zone. Surely the person on the tape couldn’t be me. This voice on the tape sounded terrible and when I hit the falsetto the whole family justifiably laughed at my strange attempt. After listening to the tape no one had to yell at me to shut up again. My ego was taken down several notches and I realized the criticisms of my singing was justified after all. This was a painful experience, but I am very glad it happened because I woke me up to he fact that one should consider the truth behind criticism, even if it is dealt out harshly. What does this have to do with soul contact? More important than eliminating personality flaws is to become self aware and that awareness of yourself be accurate. Any time you dispel an illusion you are taking one step closer to your true self. Once you see your outer self accurately you can then take steps to see the inner self correctly as well. The assignment today is to ask these questions to yourself and reflect on the answers. Do I see myself as I am or as I desire to be? Can I see myself through the eyes of others? Do I like what I see? Based in how others see me what corrections do I need to make? Another human characteristic strongly associated with the emotional self is the making of excuses. An excuse normally is an attempt to divert the reason for failure away from the cause (yourself) to something that is not the cause, but outside of yourself. Again, excuses tend to place the attention on the outer world which takes attention away from the Inner Voice. You will find that those who are sensitive to soul contact will rarely make an excuse for failure, but will take full responsibility for their actions. The number of excuses us humans can come up with are without limit. Perhaps the only real good that comes from them is that the art of imagination is used and amplified There are much better ways to put the imagination to use, however. Notice that the one thing they have in common is the blame is always placed outside the individual, the one who is truly responsible. Let us take that last excuse, for example. When you start a business you have to create and maintain it with the knowledge that there will be fluctuations in the economy. If it failed because of a downturn that is because you did not plan for the downturn, which always comes along every few years. During your good years you have to create a little cushion so you can weather the bad years. Then after the sparse season has passed many competitors will excuse themselves out of the market, opening up for greater opportunity during the next good season. People who take responsibility are not only more sensitive to soul contact, but are likely to be much more successful than those who are very creative with excuse making. Another benefit of taking responsibility is that people will enjoy your company. Those who make lots of excuses often grate on their associates who often will go out of their way to avoid them. These are all credible excuses, but there is still a big difference on how things like this are handled by the one who takes responsibility and the one who does not. The responsible one will put minimal attention on the excuse and maximum on the original intent. For instance, on that last excuse he may say, “I’ll tell you what. I’ll make it up to you and we’ll go to an even better restaurant.” The excuse maker will just throw his hands up as if there is nothing he can do to rectify the situation. Your assignment today is to reflect back on three failures you had in life. After you have identified them then reflect on past conversations where you have related these failures to others. When you told others about a failure did you also provide a great excuse that made it sound like you were a victim and the failure was not your fault and beyond your control? Are you presently still making excuses when you should be taking responsibility? What changes can you make to eliminate false excuses?